The Vault of Walt: Volume 3 Even More Unofficial Disney Stories Never Told by Jim Korkis provides another installment of this popular series. This volume, like the others, consists of essays of five to 10 pages in length. There are four main sections; one on Walt Disney stories, one of Disney film stories, one of Disney parks stories and finally one collecting stories from other parts of Disney history. Part One on Walt Disney addresses firsthand somewhat recent attempts to characterize Walt Disney as a bigot and anti-women. Also Korkis examines Walt Disney's World War I service and his smoking habits. The second section on Disney films also contains a chapter with a more recent hook, the truth behind the movie Saving Mr. Banks. The Disney Parks section includes an look at the creation of Star Wars 2.0 and the first Disneyland Christmas Parade. And the final section captures the sad biography of Jiminy Cricket's original voice Cliff Edwards and a remembrance of the late Diane Disney Miller, who Korkis knew personally. I think it is fair to say that Walt Disney has received some bad press, and bad biographies, over the last few decades. But in this volume Korkis appears to go on the offensive against those who would like to put labels on the late Disney. Korkis provides his readers with the facts to challenge those who would like to label Disney with racist or bigoted titles. And Korkis does make some strong points, especially about the people that Disney worked closely with. It is hard to imagine Walt Disney without the Sherman Brothers at his side, two Jewish gentlemen. This image makes it difficult to call Walt Disney anti-Semitic knowing how much support he provided these two legendary songwriters. And the Sherman example is just one of many. Korkis makes it clear that Walt Disney raised up creative people, regardless of race or creed. Now that is not to say that Disney was a perfect man, he was flawed like all of us. He did follow the same hiring practices of other studios, leading once to Marc Davis not being hired as an animator since it was believed by a screener that he was a woman. But Korkis' work helps to breakdown uneducated generalizations. I will admit that I really like Saving Mr. Banks. And having a historical background I understand that movies take liberties with historical facts to make a story that an audience can enjoy. So I very much enjoyed Korkis' laying out what was false, P.L. Travers did not pull her mother out of a river though the senior Travers did attempt suicide in this fashion, and what was true, Travers did once go to Disneyland it just was not with Walt Disney. This is the sort of chapter that anyone who enjoyed the movie would likely want to dive into just so they can find out if Aunt Ellie really had the parrot-headed umbrella. The Vault of Walt: Volume 3 Even More Unofficial Disney Stories Never Told is typical of Korkis' writing style and easy to read. For Disney fans there are likely plenty of nuggets to keep one entertained. I for example knew nothing about the short Off His Rockers and though I had heard the name Cliff Edwards I found myself very saddened by reading his life story. For more casual Disney fans, it would make a nice vacation read...especially if heading off to a theme park and preparing for touring by reading about Disney Parks' attractions. For either audience it is easy to pick-up, read an interesting tale and then return to later in the day with a completely fresh chapter and topic. I myself read it in this style. 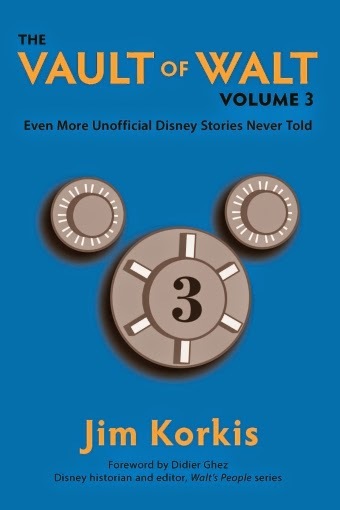 The Vault of Walt: Volume 3 Even More Unofficial Disney Stories Never Told by Jim Korkis continues to touch a variety of topics from those you thought you knew to those you have never heard about. And one expects that volume 3 will be far from the last time Korkis opens his Disney vault.